Over the years of trying new green bean recipes (it is our family’s favorite green vegetable), this has been the most flavorful way I’ve found to make them. It is a quick & easy recipe and a great accompaniment to any meal. The secret to making the color bright is due to baking soda added to the water. It not only brings out the color but also cooks the beans faster. Keep in mind that you really need to watch the beans or you will have mushy green beans in no time! Line up a handful of beans on a cutting board and trim the tips. Chop the green beans into 1/4″ pieces. Continue with the remaining beans and you’ll be done in a few minutes! Place in a 3-quart saucepan and add water to just cover the beans. Mix in the salt and baking soda. Bring to boil and as the water starts to foam, simmer and cook for about 4 to 5 minutes stirring occasionally. After about 3 minutes test a bean for the desired crispness. Remove and drain the beans. Heat a skillet on medium heat, and add the oil. 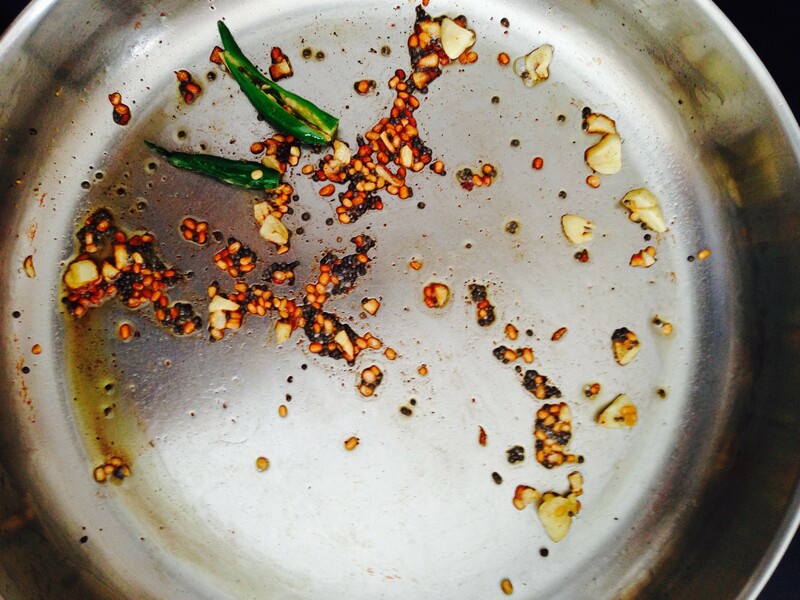 When hot, add the mustard seeds and urad dal. As soon as the mustard seeds will start to pop (you may want to use a splatter guard if you have one or just hold the lid close by to prevent splatters), add the slit green chili and the garlic. Stir for 30 seconds. Turn down the heat to medium low, add the cooked green beans and stir fry for 2 to 3 minutes. Note: If using nuts, add an extra tablespoon of oil to skillet and sauté the nuts until lightly browned. Garnish with nuts. You can add some cooked legumes to this to increase protein. Good idea, especially since vegetarians are trying to add protein when ever they can to their diet. Viji, where can I find urad dal? also, would a green chile be a jalapeno? Urad dal can be found in Indian grocery stores. If you want to, you can eliminate the urad dal and it will not change the flavor. A jalapeño can be substituted for the green chili and it would be a good idea to remove the seeds. 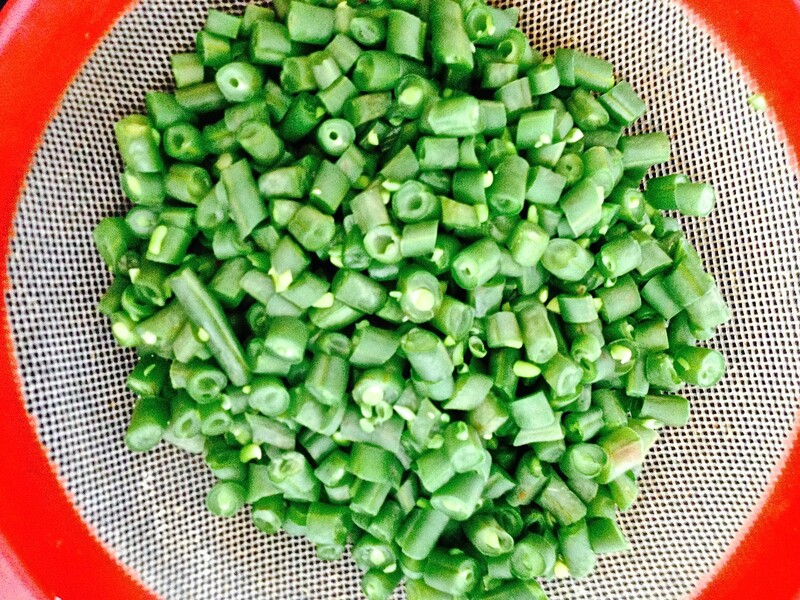 The jalapeño or chillies should be slit and kept whole as it can be removed from the green beans if necessary.